What is workflow and why is it important to understand it? According to BusinessDictionary.com, workflow is a “progression of steps (tasks, events, interactions) that comprise a work process, involve two or more persons, and create or add value to the organization’s activities.” These are processes that occur in the work environment and the steps are commonly broken into two types: sequential and parallel. In a sequential workflow, each step is dependent on the previous step; in a parallel workflow, two or more steps can occur at the same time. Whether sequential or parallel, all activities will eventually affect each other and the project as a whole, and workflow is sometimes described as simply a series of steps that produce an outcome. Workflows help people, individuals, departments, teams, etc., to collaborate on projects and manage project tasks by implementing business processes, sometimes on documents, development tasks, production tasks or other steps to bring about the completion of a process that creates value to an organization. Workflows help organizations to adhere to consistent, repeatable business processes, and they also improve both organizational efficiency and productivity by managing the tasks and steps involved in business processes. This enables the people who perform these tasks to concentrate on performing the work rather than managing workflow. Workflows are important because they streamline the cost and time required to coordinate common business processes, project approval or document review for example, by managing and tracking the human tasks involved with these processes. Another important benefit of workflow systems is that they also provide a structure for a business to measure and analyze the execution of the process as it happens so that continuous improvements can be made along the way. They may be short-term improvements, like reallocation of the workload, or they may be long-term, like redefining portions of the workflow process to avoid bottlenecks in the future. Many workflow systems also integrate with other systems being used by the organization. Examples are document management systems, databases, e-mail, office automation products, Geographic Information Systems, production applications, and many others. This integration gives structure to a process which depends on a number of otherwise independent systems. One of the major benefits of integration is that it can also provide a method or place for organizing project documents coming from any or all of the afore mentioned sources. And that can be a real advantage. All good workflow systems include a Process Definition Tool. 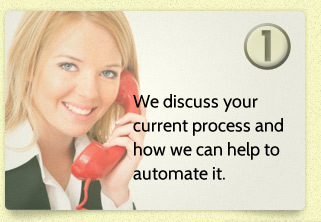 This may be either a graphical or textual tool for defining the business process. A flow chart is a good example. It depicts each step in the process and indicates whether they occur concurrently or sequentially. Furthermore, each activity within the process is associated with a person or a computer application. It could be as simple as Bill gives the report to Mary. Or maybe Bill launches a pre-programmed computer application to gather and correlate data. Rules are also created to determine how the activities progress across the workflow and what controls are in place to govern each activity. Some workflow systems allow dynamic changes to the business process by selected people, those with administrative clearance for example. There you have a basic overview of a business workflow system. Now an automated workflow system, once put in place, can simplify the process even more. That’s where an automation expert can help. Visual Integrators provides custom technology solutions for all business types and sizes. 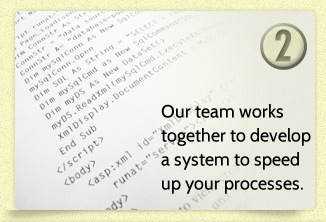 They will automate and design systems and processes around your unique business needs. Call today for your free consultation!